Recently, in the Upper Peninsula, an especially great deal of cooperation was in evidence between several DNR divisions, as well as outside entities, called to respond to the impacts of two vicious storm systems that struck the western part of the region over a 10-day period.Members of the incident command team look over a progress map at Porcupine Mountains Wilderness State Park. 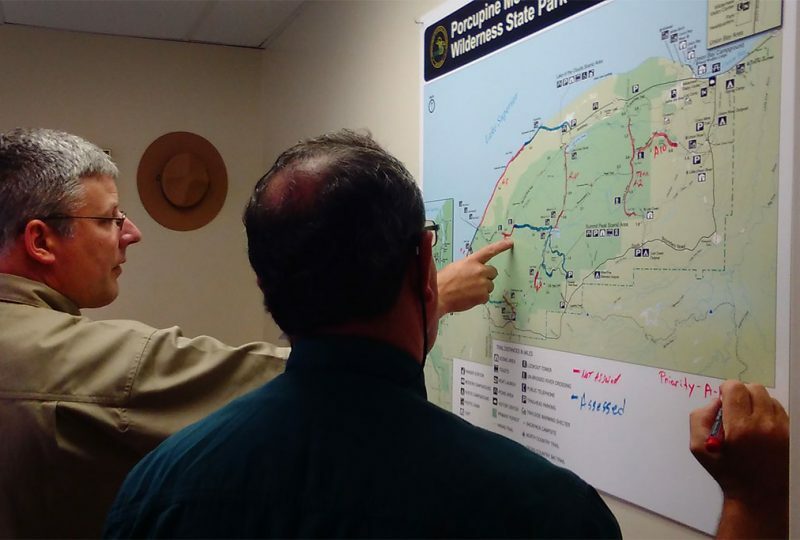 On the night of July 11, 2016, a tremendous storm – some analysts would later say it was the worst in 1,000 years – moved east from the Saxon Harbor area of Iron County, Wisconsin toward Porcupine Mountains Wilderness State Park. 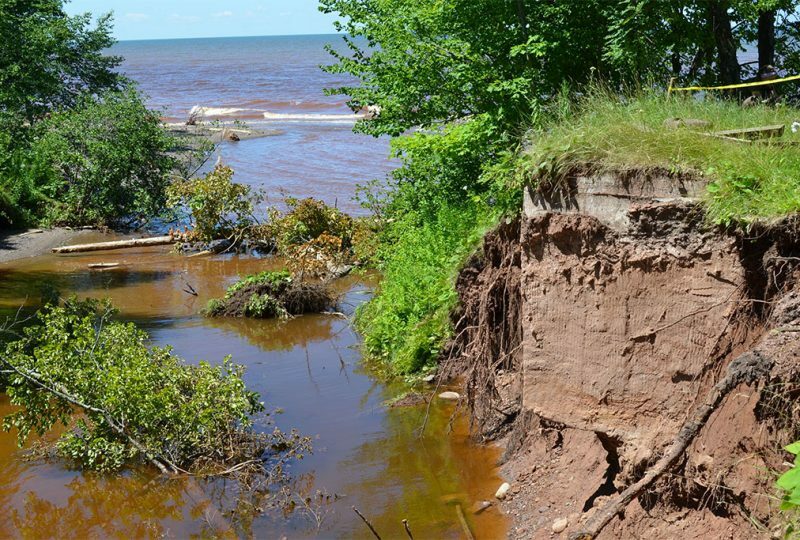 The storm dumped up to 11 inches of rain, in just four hours, causing flooding that washed out a campground and much of the marina at Saxon Harbor, damaging dozens of boats, sweeping camping vehicles into Oronto Creek, and turning Lake Superior into muddy, brown slurry. Montreal (Wisconsin) Fire Department assistant chief Mitch Koski died responding to the emergency. His vehicle was washed into the harbor where he drowned. Roadways were eaten away, flooded over and shut down. Trees toppled from along the riverbank and were washed, with boats and other debris, miles out into Lake Superior. As the storm continued east, across the state line into Michigan, the rainfall eased, but the storm still packed plenty of punch. The National Weather Service confirmed an EF1 tornado struck three miles south of Bessemer. Damage included a roof that was torn from an old ice rink and dumped into the rim of Sunday Lake. Heavy, concrete barriers (called beach prisms) set along the creek to trap sand were dragged into the stream by the raging floodwaters. In the days ahead, the U.S. Coast Guard would report a debris field slowly floating east in Lake Superior, presenting a potential hazard to boaters and swimmers. Gov. Rick Snyder toured the area. 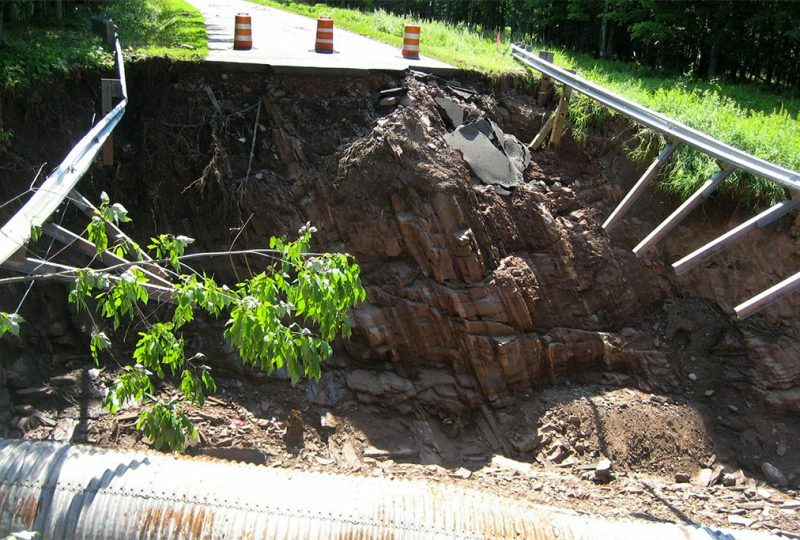 He declared a state of disaster for Gogebic County July 15, making available all state resources to local efforts to repair damage. Snyder also activated the Michigan National Guard. Not far to the east of Oman Creek, in the Presque Isle River area at Porcupine Mountains Wilderness State Park, flash flooding undercut the banks along a tiny rivulet, dropping numerous trees into a ravine. The erosion would force permanent closure of one site on the Presque Isle Campground loop. A trail leading from the campground to Lake Superior was shut down temporarily until toppled trees and mud could be removed. In 90 minutes, 6-8 inches of rain fell here. Throughout the western section of Michigan’s largest state park, small creeks rose well beyond their banks, repeating dramatic scenes similar to those evidenced at the Presque Isle campground. Backcountry trails and cabins were closed. Bridges were damaged or washed out. A cabin alongside Speaker’s Creek had to be moved after floodwaters carved off sections of the sandy streambank. Park staff feared continued erosion would undermine the foundation of the cabin. 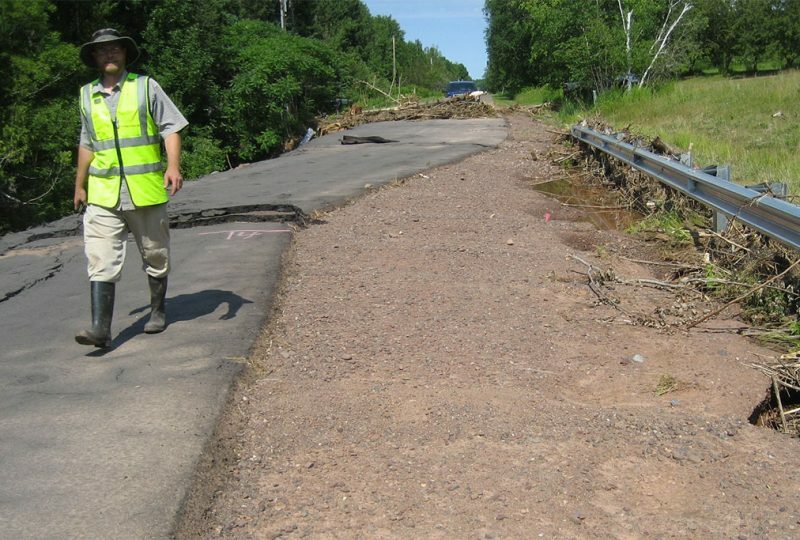 In response to the damage, which occurred during the height of the summer camping season, the DNR put an incident management team in place to organize cleanup in the aftermath of the crippling storm. 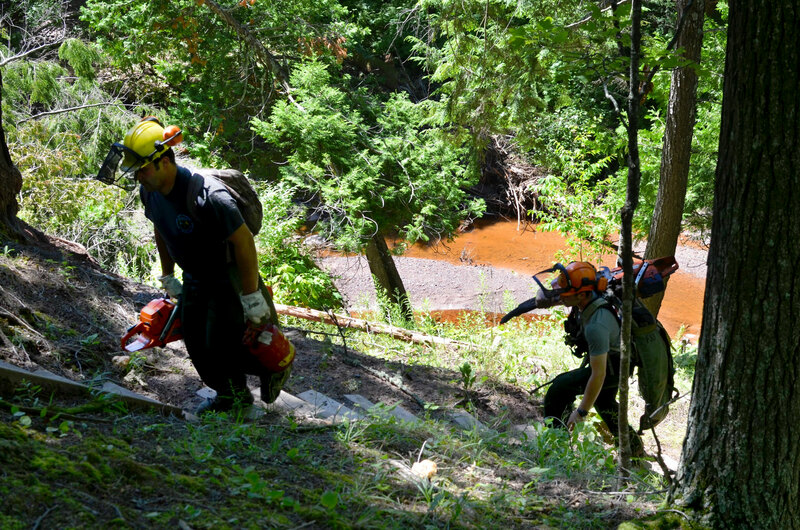 Those DNR divisions responding to the incident included Parks and Recreation, Forest Resources, Law Enforcement, Executive, Marketing and Outreach and Finance and Operations. The Ontonagon County Sheriff’s Office provided equipment and inmates from the state’s Ojibway Correctional Facility in Marenisco assisted crews. DNR personnel from the Forest Resources Division set up an incident command center at the state park. Many of the staff involved in the response was working outside the center. 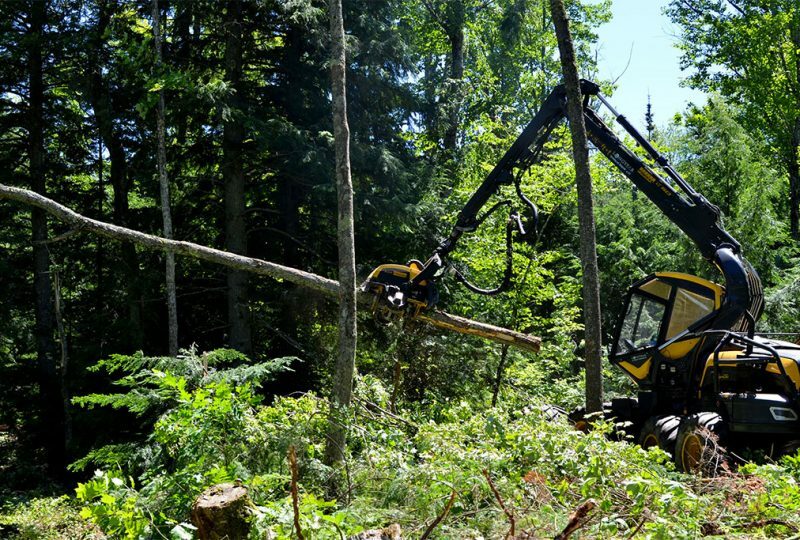 With chainsaws over their shoulders and hardhats on their heads, crews headed into the forest to begin the massive task of clearing trees, repairing boardwalks and reducing trail hazards. 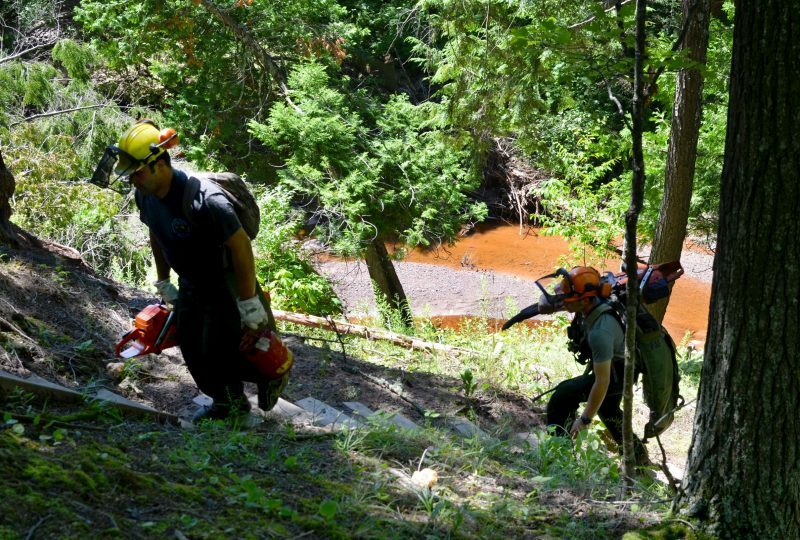 Prison crews of eight men and a supervisor helped DNR Forest Resource Division workers clear the trails. As a result, a great deal of progress was made. Backcountry cabins and campsites that had been closed were reopened two days ahead of schedule. Ten days after the violent storm hit the west end of the park, a complex of thunderstorms slashed through the eastern half. The National Weather Service office in Negaunee Township confirmed pockets of significant tree damage from Ontonagon east toward Baraga. The roof of a yurt was blown off at Union Bay. Straight-line winds clocked at 90 mph were recorded at the Emily Lake State Forest Campground, situated south of Twin Lakes State Park in Houghton County. Those strong winds pushed trees onto power lines, knocking out utility service for more than 20,000 customers, including several of the state parks in the western Upper Peninsula – Twin Lakes and the Porcupine Mountains included. 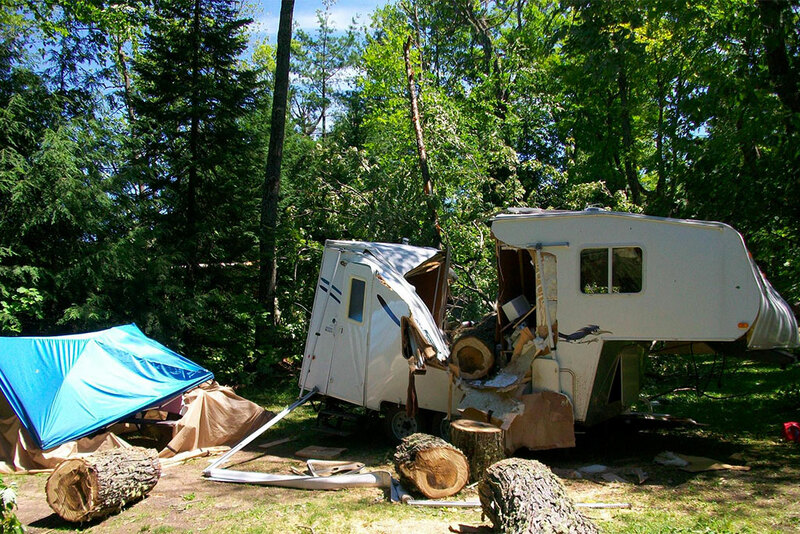 At Emily Lake, falling trees slashed through the shells of two travel campers at the park. Campers escaped miraculously, without injury. Four of the nine campsites were occupied during the heavy thunderstorms. 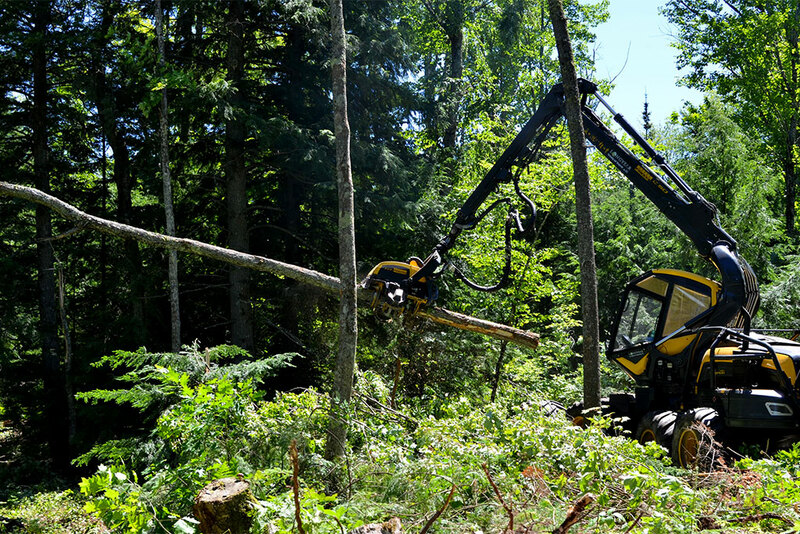 Because of the extensive number of fallen trees, DNR staff called in a professional sawyer crew from J.M. 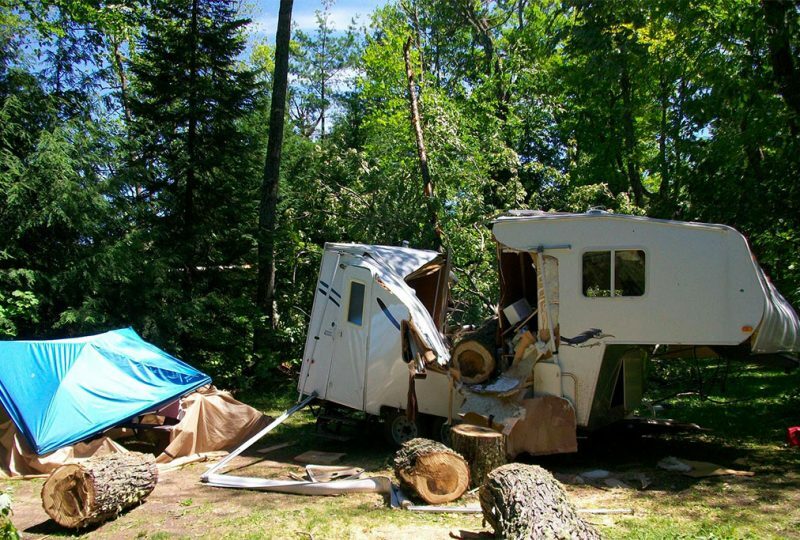 Longyear LLC of Marquette to clear safety hazards at the campground, including leaning trees and dangling overhead branches. Along with the campground, loggers also cleaned up roughly 15 acres around the boating access site area and along Pike Lake Road. Get more information on Michigan state parks at www.michigan.gov/stateparks. Share the post "DNR collaborates to repair summer storm damage in western U.P." Categories: Featured, Ontonagon County, and Parks.